Living in Toronto offers fantastic architecture, amazing restaurants, endless culture, and exciting sports. It’s not difficult to fall in love with our city. But when you’re ambushed by a blizzard on the 401, it’ll make you wish you lived anywhere else in the world. Even (shudder) Vancouver! Winter roads in the GTA will make even the most patriotic of Torontonians question their municipal loyalties. Safe driving in treacherous conditions with your family in tow is both stressful and mentally exhausting. And that’s why Tire Butler is at your service with these helpful winter driving tips! All-season tires sound alluring: they’re a one-and-done solution for all of your tire needs, equipped for versatility and road safety in any climate. Best of all, your car will be fitted with all-season tires fresh out of the factory, meaning there’s no need to worry about the time and cost of constant tire changes. All-season tires are jacks-of-all-seasons but masters-of-none. 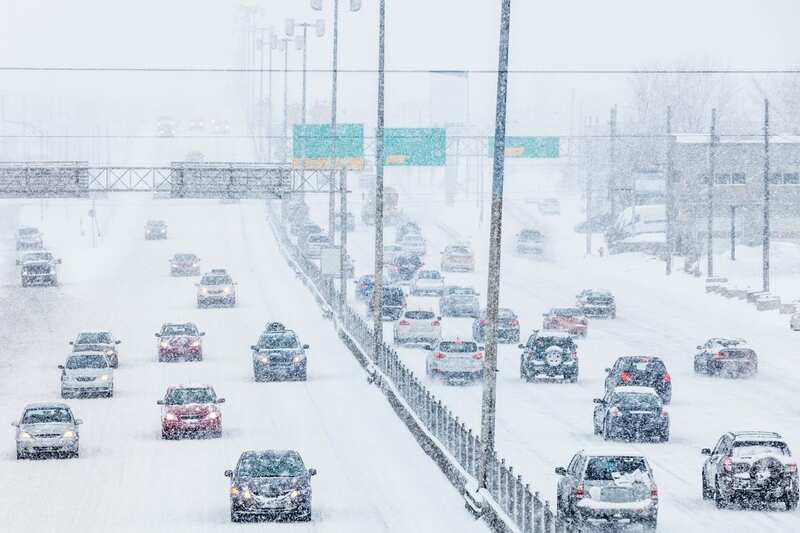 Since they need to perform in every road condition, they make detrimental compromises when it comes to specific nuances required for seasonal driving. The harsh conditions of Canadian winters require specialized tires for the sake of you and your family’s safety! While all-season tires work well in moderate climates, they lack in the extreme grip and sharp handling required in the winter. Changing to snow or winter tires is the only way to ensure your car can deftly maneuver through the brutal, ice-filled snowy slog synonymous with winter. When the wind-chill is cold enough to freeze your nostrils shut, tread rubbers will stiffen, which ruins tire traction. Winter tires have tread rubber compounds designed to remain flexible in the extreme cold, providing a reliable grip. Their increased tread depth reduces snow buildup, also providing better traction. Snow tires’ increased levels of siping means there are thousands of tiny slits in the tread, providing even further traction on ice. Plus, their unique tread patterns channel snow and slush while expelling water. Have a technician ensure that your car battery is ready for the cold mornings, or else you’ll be off to a rough start this winter. Battery contacts must be cleaned and free of corrosion; you can remove any white powder with a wire brush. If your battery has given you a few good years of service, replace it before the winter season—better safe than a car battery dying in -30℃! Winter tires are important, but you still have other important things to do. Long trips to a service garage are usually accompanied by longer waits—wasting your precious day. That’s why Tire Butler offers at-home tire services such as seasonal changes, repairs, and storage. We understand that you have a busy life, and can’t afford a tire change taking up your entire day. We take care of your tires, while you take care of your day.